It will become compulsory to link Aadhaar Number with PAN Card, with effect from July 1, 2017. According to the Finance Bill of 2017, every PAN Card application will need a mention of the Aadhaar Card Number and every PAN-Card-Holder must make sure that their PAN Card is linked to their Aadhaar Card. If the above-mentioned criteria are not fulfilled, your PAN card will become invalid. Is it Mandatory to link PAN to Aadhar for the Assessment Year 2017-2018? It is not compulsory to link PAN with your Aadhaar number when you file Income Tax Return for the Financial Year 2016-17. However, your Aadhaar Number or Aadhaar Enrolment ID needs to be quoted in the IT Return form. Kindly remember that filing of IT Return for the Assessment Year 2018-19 (Financial Year 2017-18) cannot be done without linking the Aadhar number with the PAN number. Note: It is not mandatory to quote Aadhaar Number in IT Return forms for individuals or NRIs who are not Indian citizens / those above the age of 80 years / those residing in the states of Assam, Meghalaya, and Jammu & Kashmir. You can login to the e-filing portal of the Department of Income Tax (Below the Menu tab: Profile settings) and link your Aadhaar Card to PAN number. However, it is not as simple as it sounds. 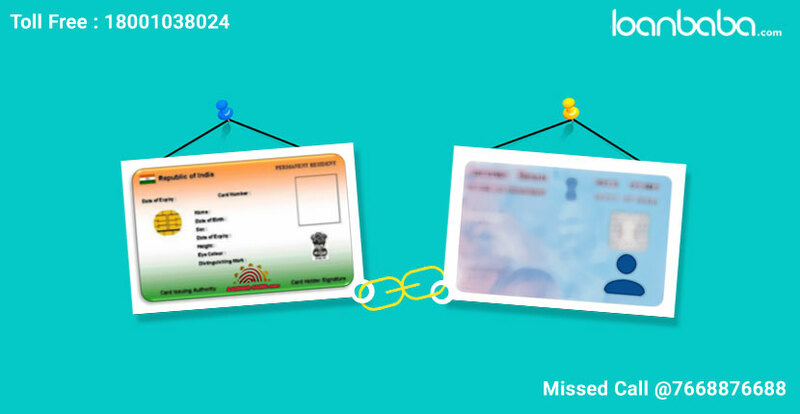 If your name displayed in the Aadhaar Card differs from the name shown in your PAN Card, then the linking cannot be done. 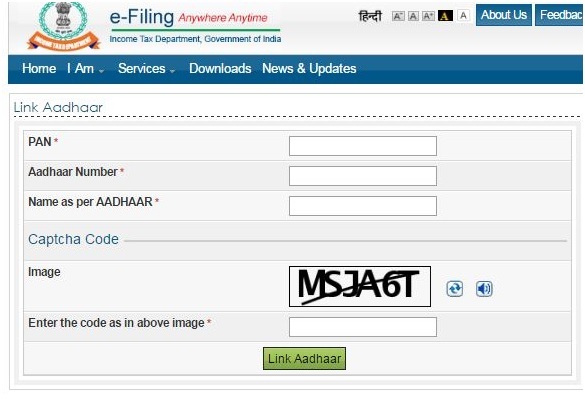 You might need to have your name corrected in your PAN Card before you try the linking. Example: The Aadhaar Card might have only your Initials as your Name, while your PAN Card might have your full name with the initials expanded. Considering this obstacle and trying to make it simple for a taxpayer to link their Aadhar with PAN, the IT Department has started a new online facility. Now, you can link your PAN with your Aadhaar in 3 simple steps. This e-facility enables you to link Aadhaar with PAN in just a few minutes even if your name in both the cards does not match. How can you Link your Aadhar Number with your PAN Card in 3 easy steps? The simple procedure has been graphically explained below. You do not need to register on or login to the e-filing portal. Anyone can use this facility to link their PAN and Aadhaar. 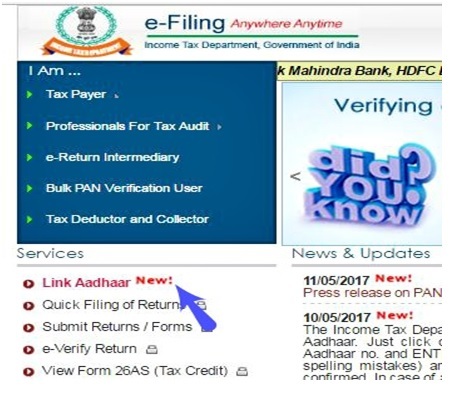 1.Visit the Income Tax Dept’s e-Filing Portal and now click on “Link Aadhaar” that is displayed on the website’s home page. 2. After you click on “Link Aadhaar”, you will be redirected to a different page. There, you would need to enter your Name as mentioned on your Aadhaar Card, your Aadhaar Card Number, and your PAN Number. Please ensure that the name you enter is exactly how it is displayed in your Aadhaar Card. You would also need to make sure that information like Gender, Date of Birth, and Aadhaar number are exactly what your Aadhaar Card displays. After checking, click on “Submit”. 3. Later to verification from Unique Identification Authority of India or UIDAI, you will get confirmation about the linking with a display message that says, “Aadhaar-PAN linking is completed successfully”. In case of any minor mismatch between the Aadhaar name that you have provided and the information existing in the PAN documents, Aadhaar OTP or One Time Password is sent to your email or mobile registered with your Aadhaar. Link Aadhar Card with PAN Card via SMS: You can now link your Aadhar card number with PAN card by sending an SMS to 567678 or 56161. In rare cases when your name in the Aadhaar Card is totally different from your name in PAN, the linking is going to be unsuccessful and you will be asked to make alterations in the name in either the PAN database or in the Aadhaar records. Visit the NSDL website in order to update your PAN database. Visit the UIDAI website, in order to update your Aadhaar database. This simple process helps you complete the linking of your PAN with your Aadhaar, without delay. This will be helpful in the E-Verification of Income Tax returns using the OTP sent to your email address or mobile number.